A few weeks ago a large but completely weightless box arrived at the door. Indiana was lucky enough to receive a Toddlebike2 – perfectly timed as an early birthday present – and I’m not sure who was me excited; me or Indie haha! The second it was out the box Indie was shouting ‘bike!’ and wanted to jump on. She’s had little bikes in the past, but this one was different, it just seemed so much more suited to her, and toddlers in general. Firstly the bike is VERY light. This makes it easy for Indie to grab and take wherever she wants. She loves bringing it over to anyone who comes over to show it off, and you can really see how proud she is of it. This also makes it so easy to take out and about. It’s light enough to hang off the pushchair (a must as I’m never out without it! ), and where it’s so small it doesn’t take up room in the car either. Despite it’s lightness, it is very robust and sturdy. Most toddlers don’t understand the concept of ‘gently’ so once it’s picked up, it’s thrown around A LOT haha. It’s made of hard-wearing plastic so it’s also waterproof, weatherproof and basically toddlerproof! The fact it’s made of plastic makes it easy to clean. I love this as it means we can use it inside (which will be happening a lot more now winters settling in), as well as taking it out. The bike is suitable from around 18 months, up until they’re ready for a real balance bike or scooter. 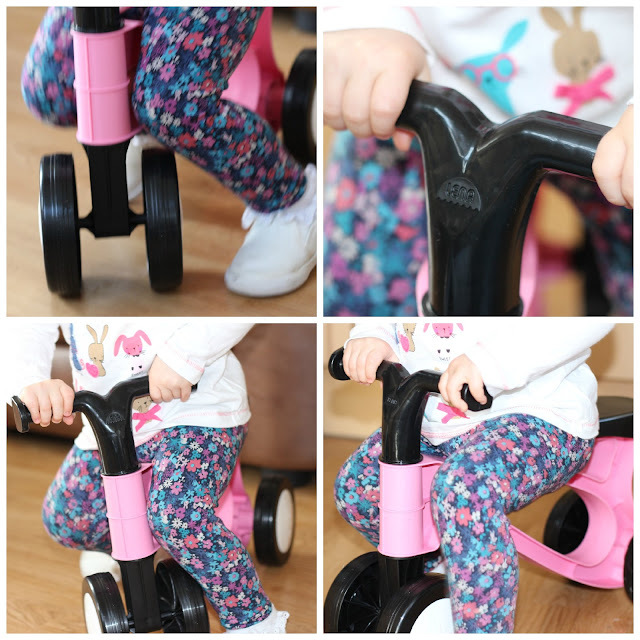 The narrow wheels aid learning to steer and balance by themselves. Indie mastered quite quickly how to sit on the seat and push herself along. The frame being inline with the seat however means that when they are learning, they can use this instead! 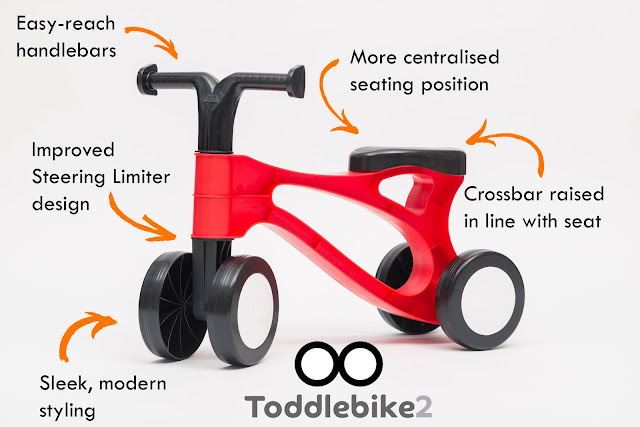 I would 100% recommend – and already have to a number of mummy friends – the Toddlebike2! It’s perfect for giving your toddler their independence from the pushchair, and is great fun too. What’s fantastic also is the price; it’s currently only £23.95 with FREE UK and Ireland shipping from Toddlebike and John Lewis.